As is normal for this time of year, ice extentincreased rapidly through most of October. However, this year, the increase was particularly fast, which contributed to above-average air temperatures near the surface. A look back at the entire melt season from March through October reveals that the Arctic sea ice is showing some unusual changes in growth and melt cycles. Note: With the close of the melt season, we have now returned to showing monthly average extent in Figure 1. During frequent summer updates as the crucial melt season progressed, we showed a daily extent value. Daily images are still available in the upper right of the home page. 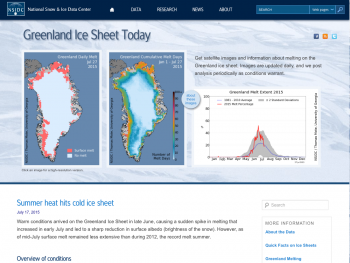 For more information, read our Quick Facts on Arctic Sea Ice. Figure 1. Arctic sea ice extent for October 2008 was 8.40 million square kilometers (3.24 million square miles). The magenta line shows the 1979 to 2000 average extent for October. The black cross indicates the geographic North Pole. Sea Ice Index data. About the data. Sea ice extent for the month of October averaged 8.40 million square kilometers (3.24 million square miles). As of October 31, ice extent was at 9.27 million square kilometers (3.58 million square miles), more than doubling since the annual minimum of 4.52 million square kilometers (1.74 million square miles) measured on September 14, 2008. October ice extent was 0.89 million square kilometers (0.34 million square miles) less than for the 1979 to 2000 average, but 1.63 million square kilometers (0.63 million square miles) greater than for October 2007. Figure 2. The graph above shows daily sea ice extent.The solid light blue line indicates 2008; the dashed green line shows 2007; and the solid gray line indicates average extent from 1979 to 2000. Sea Ice Index data. As autumn and winter take hold in the Arctic, sunlight wanes and days get shorter. The ice pack begins its annual growth cycle. The 2008 growth rate was especially strong in early October but subsequently slowed down slightly. Figure 3. In this image, near-surface air temperatures show strong warming near the surface in the Beaufort sea region, an area with substantial open water at the end of the melt season. The anomalously high temperatures extend well up into the atmosphere, showing that the ocean is transferring heat to the atmosphere as ice forms. The vertical axis represents altitude measured by pressure, extending from the planet’s surface to 700 millibars (about 3,000 meters or 10,000 feet above sea level). The horizontal axis represents latitude from 50 degrees North (left) to 90 degrees North (right; North Pole). Over much of the Arctic, especially over the Arctic Ocean, air temperatures were unusually high. Near-surface air temperatures in the Beaufort Sea north of Alaska were more than 7 degrees Celsius (13 degrees Fahrenheit) above normal and the warming extended well into higher levels of the atmosphere. These warm conditions are consistent with rapid ice growth. The freezing temperature of saline water is slightly lower than it is for fresh water, about –2 degrees Celsius (28 degrees Fahrenheit). While surface air temperatures in the Beaufort Sea region are well below freezing by late September, before sea ice can start to grow, the ocean must lose the heat it gained during the summer. One way the ocean does this is by transferring its heat to the atmosphere. This heat transfer is largely responsible for the anomalously high (but still below freezing) air temperatures over the Arctic Ocean seen in Figure 3. Only after the ocean loses its heat and cools to the freezing point, can ice begin to form. The process of ice formation also releases heat to the atmosphere. Part of the anomalous temperature pattern seen in Figure 3 is an expression of this process, which is generally called the latent heat of fusion. In the past five years, the Arctic has shown a pattern of strong low-level atmospheric warming over the Arctic Ocean in autumn because of heat loss from the ocean back to the atmosphere. Climate models project that this atmospheric warming, known as Arctic amplification, will become more prominent in coming decades and extend into the winter season. As larger expanses of open water are left at the end of each melt season, the ocean will continue to hand off heat to the atmosphere. Figure 4. This animation of sea ice between September 1 and October 30 shows this year’s rapid ice regrowth. Data from AMSR-E sea ice concentration fields from the University of Bremen. As mentioned above, unusually high air temperatures go hand-in-hand with the rapid increase in ice extent seen through most of the month of October. At its fastest point on October 15, the 2008 ice growth exceeded the 2007 growth rate on the same date by 92,000 square kilometers (36,000 square miles) per day. The near-record daily growth rate slowed toward the end of the month and has now fallen below the 2007 growth rate. It is important to reiterate this fast rate of growth is not unexpected under current conditions. As discussed in our September 16, 2008, post, this year’s annual minimum represented the second-lowest point observed in the satellite record, surpassed only by the 2007 minimum. However, if we look at the total extent of ice lost between the March maximum and the September minimum, 2008 set a new record for total ice loss over an entire melt season. For more on the relatively high levels of ice that started the 2008 melt season and that led to this new record, see our April 7 post. Arctic sea ice and climate are behaving in ways not seen before in the satellite record—both in the rate and extent of ice loss during the spring and summer, and in the record ice growth rates and increased Arctic air heating during the fall and winter. Serreze, M.C. and J.A. Francis (2006). 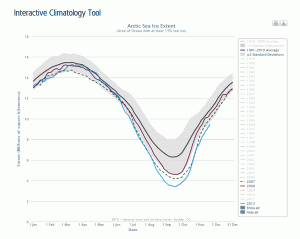 The Arctic amplification debate. Climatic Change, 76, 241-264.